A report from SoDA and Forrester found 50% of companies had fully sourced social marketing, customer analytics, and at least some form of digital experiences in-house. However, despite the previous year’s studies showing client-side marketers desiring to move more in-house, they cite an internal talent shortage preventing them from fully realizing their desires. Plus, 1 in 5 are working with a smaller overall digital marketing budget than the previous year. Which begs the question, how can you stretch your dollar further? We’ve put together 17 tips curated from our in-house team and other video experts to help you optimize your budgets. Keep track of things making you less productive and set aside some of your earnings to fix the inefficiencies. Keep track of hours to identify bottlenecks and what hinders your efficiency. “It may be cool to have multiple super-fancy cameras, but it might not be necessary for your end goal and just adds to the budget,” Elizabeth Madariaga, owner of Edios Media. If you’re building a production team in-house, you can help make your team mean and lean by hiring folks who can wear multiple hats. For example, a shooter who can run lights or someone who can run audio that also acts as the Digital Imaging Technician. Ideally, the editor will also have input during pre-production to save you time and create a better end video. Storyboard to ensure everyone is on the same page with the way key visuals are composed before shooting. Storyboarding can also serve as your shot list for the day of filming. “Many of the companies I've worked for have paid extraordinary prices to fly talent in from around the globe. Unless you're a super high-end fashion brand needing a very specific type of look, you can most often find talent in your local area,” said Andrew DeBell, founder of Jam Campus. If you’re shooting offsite, scout the location(s) to determine which may be problematic. Ideally the director and anyone managing cinematography, lighting, and audio should be on hand for scouting. “Most department heads will welcome you and do simple scouts at a reduced rate or sometimes at no charge, just to make shoot day easier for them and for you,” said Robert Starling of Starling Productions. You may also find if your team is shooting in another city there may be iconic spots you want to go ahead and grab b-roll could be handy for other projects. After you have a script, storyboard, shot list, production schedule and call sheet in place, schedule time with on-air talent to go over scripts before shooting. Pre-production is the right time to recast. Not every video project is a larger budget affair. Empower your marketing and outbound teams to shoot smaller reach content that can pay off like personalized video sales messages and video for their LinkedIn profile feed. Storytelling starts long before the camera rolls. Once an initial script is created, get everyone’s input on whether the messaging is effective and on brand. And stay on script day of shoot! Adding even a simple scene or different angle isn’t just as easy as shifting the camera and having the talent say it “this way” or sit instead of stand. The simplest reset can take 15-20 minutes or more. Two to three of those can easily put your crew into overtime or make you miss another shot at the perfect time during an outdoor shoot. Speaking of scripts - with how sensitive some marketers can be about being too pushy - sometimes the original point of a production becomes lost in translation. Create clearer CTAs to stay aligned on your business goals. Clumping closer locations together during scheduling can not only help, so can planning ahead to shoot smaller-bite sized content as you tackle your more critical video content. Even if you’re moving your video production in-house, identify all the end deliverables in pre-production. If you’re interviewing someone give them time on camera to get comfortable and then circle back on questions where their previous answered contained umms and ugghs. This can get you better raw footage and cut down on editing time. Transcribing footage isn’t the optimal use of your production team’s time. Use Temi or another transcription service to complete this essential but time-consuming task. If you’re creating many different videos you likely have quite a few people needing to access them from production to corporate communications. Utilize shared storage and create a process for naming files to help everyone quickly get to the latest version of what they need. Explore the Complete Guide to Media Asset Management to learn about our MAM platform. 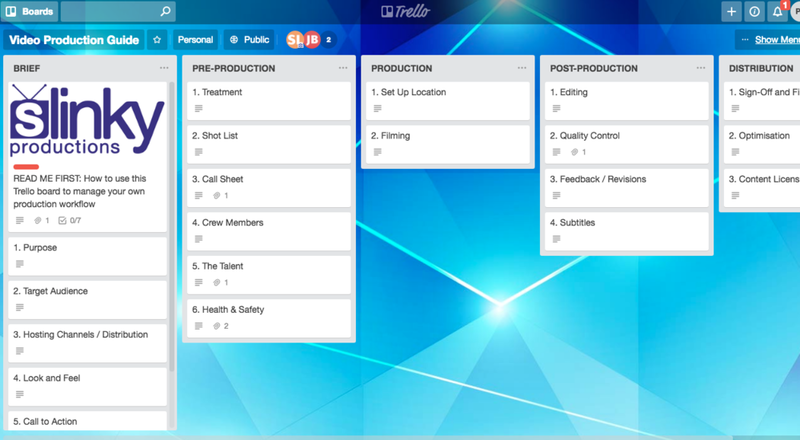 Have you mapped out your production workflow in project management software like Slinky Productions did with their Trello board? Save time by also having in place templatized call schedules, shot lists and other essential documents you’re already using. Leverage Google Keyword Planner in creating the titles for your content to help increase your reach on both Google search and YouTube. Looking to scale up the amount of video content you’re distributing? Build out your production team in-house. Many companies also have found it advantageous as they have instant access to the successes of all their video campaigns versus waiting days to set up a meeting to go over results with an external partner. Unilever last year reported saving 30% on production costs after moving more of their advertising in-house. Once you have a rough cut or final video ready to be seen by the rest of your team, save time and centralize all specific communication for each video using Wipster Flow. From the Flow dashboard you can see the status of each video and whether it’s in review, approved, or undergoing edits. And once a video has the green light, you can quickly publish it onto multiple online platforms with Wipster Pulse. For more tips to help you manage your pre-publishing workflow, read our full guide. Older PostA Video-First Multi Asset Management System: Does Your Company Need One?